Looking for an activity to take your daycare kids too? 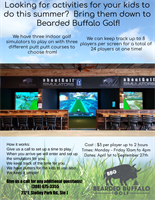 Come down to Bearded Buffalo Golf and play putt putt! We have three courses to play. Bring the kids down when it's too hot or raining outside!